Having a side by side picture app is a must if you like taking pictures. You can easily insert various images into one without having to swipe who knows how many times. There is multiple “side by side picture apps” you can choose from for excellent results. The side by side picture apps come very handy when you need to put two pictures into one – just for comparison or to tell a story on popular apps like Instagram. Whatever be the cause for putting two pictures side by side into one, there isn’t any easy way to do that without having a powerful and robust image editing tool. But unfortunately, you can’t always have access to such tools. Thankfully, with advancement in technology, you have many tools to do so on the go – even with just your smartphone. The various side by side picture apps that can help you do that exactly. Many good apps to put two pictures side by side are available. But the only problem with having so many options is that you don’t know which ones are worth the storage space. The following apps are the most used side by side picture apps on Google Play and ones that I think you’ll like. With Collage Maker you can enjoy one of the best side by side picture apps out there. This app allows you to create a collage with up to 15 pictures, and you can change the pictures at any time (just as long as you don’t tap on Save). You can also choose from over 100 layouts and grids to create the perfect side by side picture. The app also offers emojis, stickers, text, filters, and background colors/patterns. The collage categories you can choose range from a grid, freestyle, and multi-fit. If you want to share your creation with others, the app also has a sharing feature to your favorite social networks. That way you can show your friends what you’ve made no matter what social media/instant messaging app they are using. Since there is a good chance that you’re an Instagram users, the app also features Insta square photo with blur background. That way you can have one fantastic profile picture. 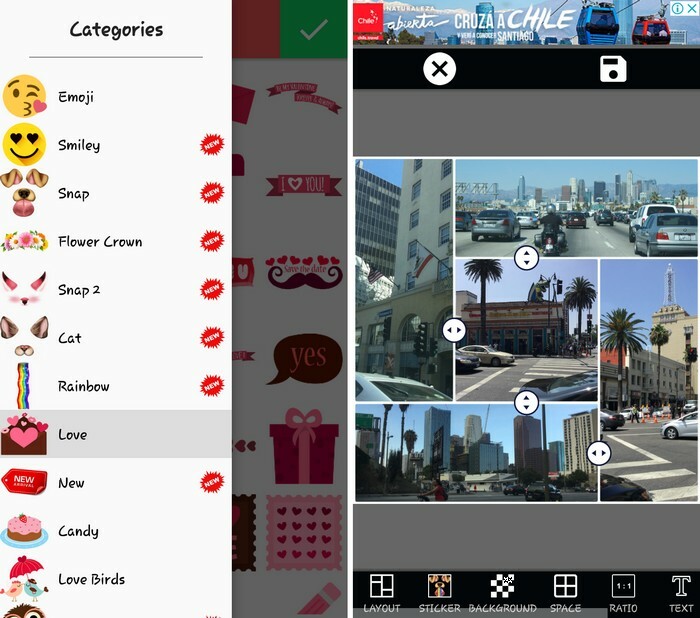 Pic Collage Maker is a side by side picture app with more options than the first one. The collage grids are more original, and it also has fun animals stickers you can place on people’s faces. 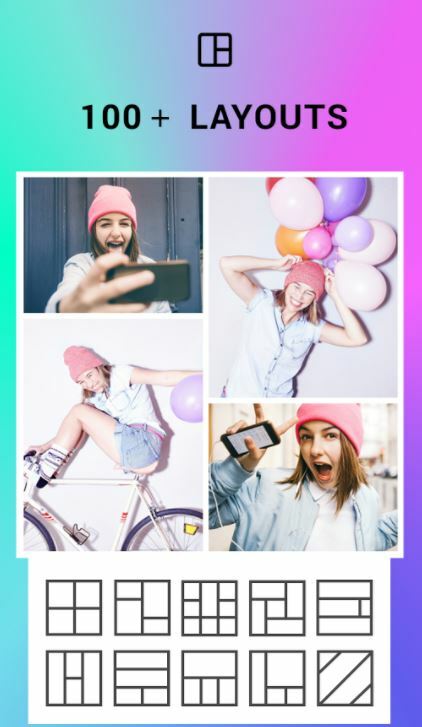 This app offers unique grids, filters, photo editing tools, and effects. You can add as many as 20 pictures to create the best side by side picture ever. There are 37 photo effects to choose from, and you can modify the text in various ways. For example, you can change the color, font, and decide how much shadow to add as well. If you’re not happy with how the app laid out the pictures, you can rotate, mirror, flip, swap, drag, zoom, and pinch them. The list of options doesn’t end there since you can also add borders, frames, and add a blurred background to your image. 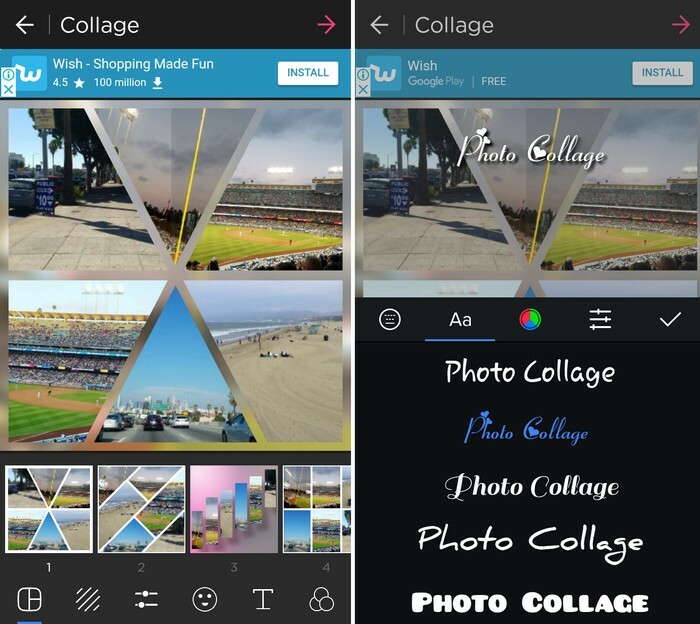 Another side by side app you can try is Collage Maker by InShot. It’s a very easy to use app for placing two pictures into one, so it’s great if you’re not very tech savvy. This app only lets you add a total of nine pictures, but it does offer over 100 layouts of grids and frames. There are also various ways you can modify the text such as adding a background texture, changing the color, adjusting the font, Snapchat style layout, adding shadow and an outline. You can also choose from an extensive amount of stickers, but there are some that will require that you download an extra app to use them. Once you’ve created the best side by side picture, you can add things such as filters, drawings, and more! There are also essential photos editing tools you can use to give the image that final touch. With Photo Editor Collage Maker Pro, you can have fun with different style grids than from the previously mentioned side by side picture apps. This app offers styles you won’t find in any of the other apps on this list. The design of the grids you see is going to depend on the number of pics you want to add. On the app’s main page you have quite a few options when it comes to what you want to do with your pictures. For example, you can create a collage, make a side by side picture, size, and add an image to a shape frame. You can also choose from different background designs such as colors, hearts, ties, wooden patterns and more! In the Ratio option, you can change the ratio of the collage to either 1:1, 2:1, 3:2, and 2:3. 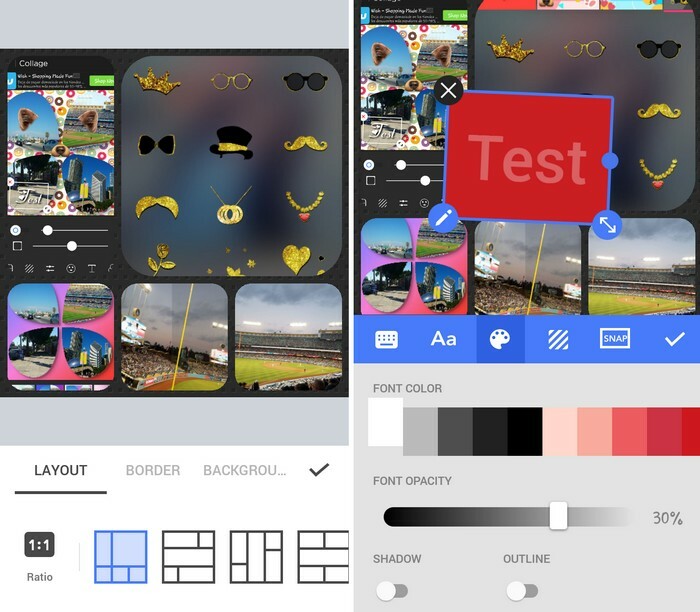 If you’re just looking for a simple side by side picture app, then you should give Pic Collage – Photo Editor App a try. A unique feature this app offers is that you can create cards with your images. You can choose from categories such as featured, Happy Birthday, Autumn, Thanksgiving, Everyday Life, Congrats, Thank You, Get Well, Love, Wedding, Baby, For Mom, For Dad, Family, and more! You can also add stickers from Pac-Man, Hello Kitty, Tokidoki, Barbie, and more! The pictures you import don’t have to be on your camera roll, they can also be taken from Instagram or Facebook. There is also a freestyle feature where you can place the picture anywhere you want. 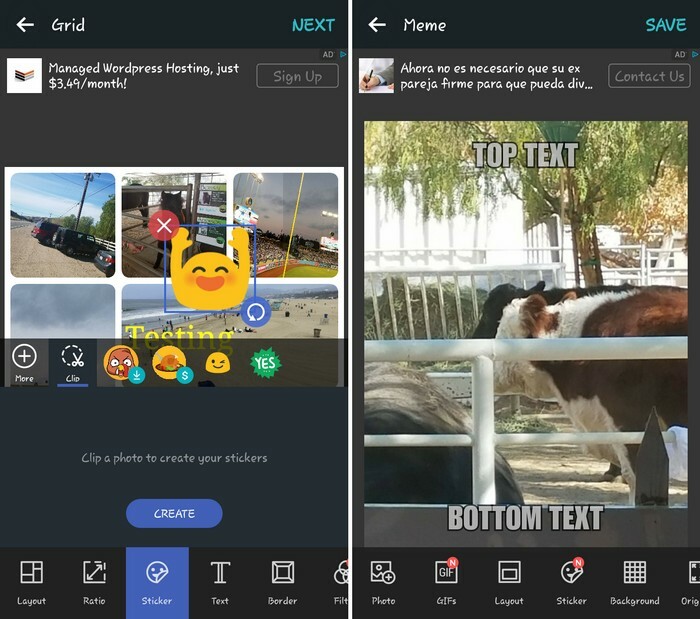 The app also features GIFs you can add to your collages and share them as looping videos on Snapchat, Facebook, Instagram, and other social networks. PicsArt Photo Studio is one of the most popular side by side picture apps out there. It does require that you sign in by either creating an account, using your Facebook account, or by using your Google account. There are hundreds of templates for you to choose from and 1000 new background images are uploaded every day. At least with this app, you can’t complain about the lack of options. In the stickers options, you can either add stickers of emojis, special occasions, love, emotions, trees, and more. You can also add filters, adjust the borders, add a background image, and change the radius. Give your collages some more styles with the customizable layers, brushes, and professional drawing tools. You’ll also like that the side by side picture app allows you to take pictures with live effects. If you have a competitive spirit, I think you’ll like that the app has creative contests and photo challenges. 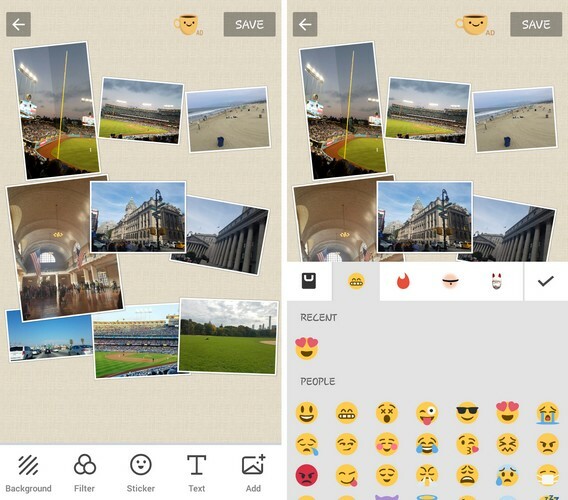 With over 100 million downloads, PhotoGrid has the features you need to create the side by side picture anytime. The app offers you traditional grid designs, but nothing with the design of flowers, hearts, Etc. There are also various filters for you to choose from as well as Stickers. This app may not have a large variety of stickers like other apps to put two pictures side by side, but it does have one feature that stands out. You can cut out people or objects from other pictures and create your own stickers with them. 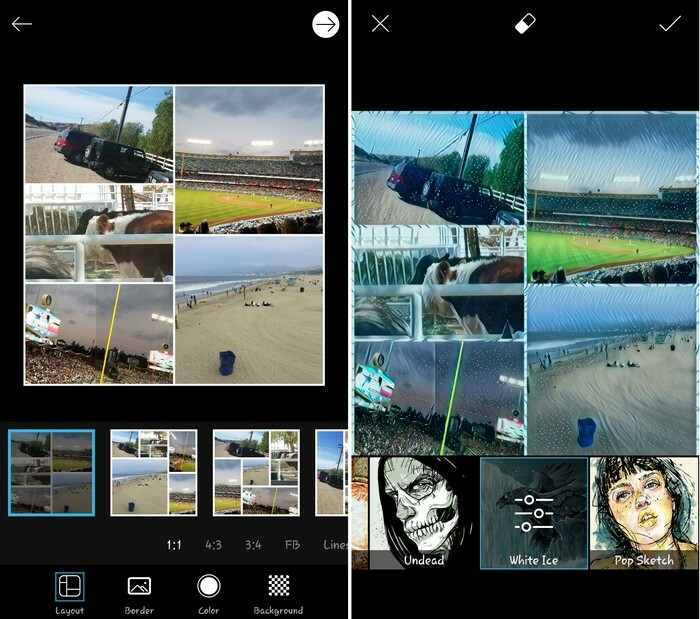 The side by side picture app features filters, but you can also adjust the coloring of the collage manually. You can even draw of your collages, add borders, backgrounds, add your personalized watermark, and you can also give the outside of the collage a design with various cuts to choose from. I also recommend that you give the video collage maker a try. Whoever said that you could only make collages out of images and not entirely out of videos, right? Don’t forget to also try the more than one hundred unique facial recognition filters to make your collages even better. If you love taking pictures then having a side by side picture app is must on your Android device. You’ll be able to unite various images into one and not have to swipe to admire more than one. All of the side by side picture apps on this list are free and are fun to use so you won’t be wasting your time at all. So, the next time you want to forget about work for at least a little while, give at least one of these apps a try. I can assure you that by the time you are done going through the list, you’ll at least have a few on your Android device permanently. Which app do you think you’re going to try first? Leave a comment and let me know. Previous: TRP Guides: How to Close Apps on Android the Right Way?